How do stars like our Sun come into being? Which fundamental processes are responsible for transforming a dark and diffuse interstellar cloud of gas and dust into a much denser, shining object? Astronomers have just taken an important step towards answering this fundamental question. Based on the most detailed study ever made of the internal structure of a small interstellar cloud, three scientists from ESO and the USA  have found that it is apparently on the verge of becoming unstable - and thus in the stage immediately preceding a dramatic collapse into a dense and hot, low-mass star. 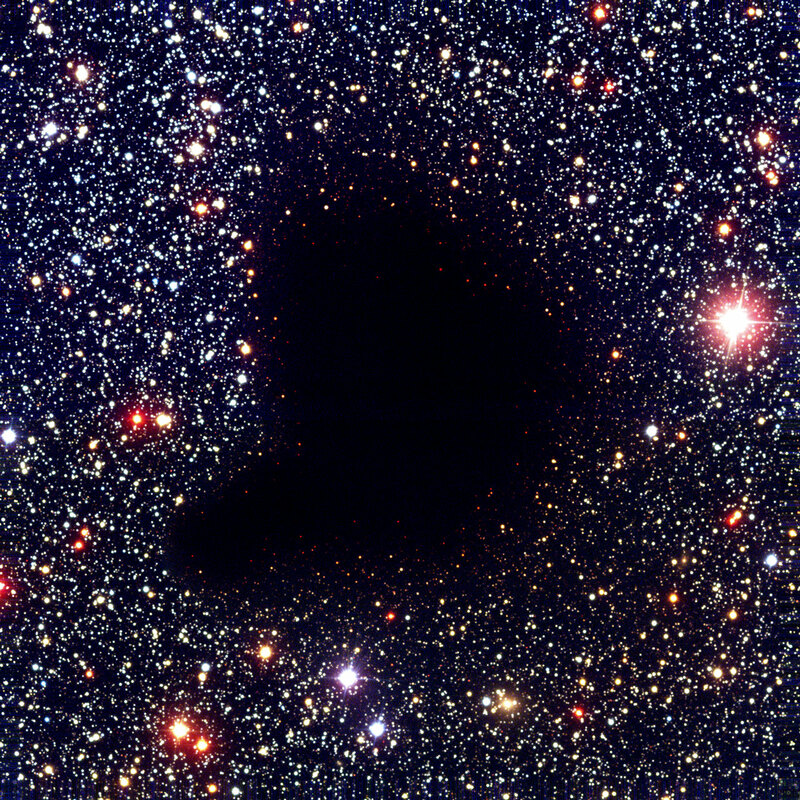 Interestingly, the current structure of this cloud, a "Bok globule" known as Barnard 68 (B68) , is governed by the same basic physics as is that of a star. The cloud is obviously in a temporary state of near-equilibrium, where the inward force of gravity caused by its mass more or less balances that of the outward pressure due to its temperature. But this situation may not last long. The astronomers believe that this particular cloud, together with some others in the same galactic neighbourhood, constitute the few resistent remains of a much larger cloud that has disappeared due to the influence of strong stellar winds and ultraviolet radiation from young and heavy stars as well as supernova explosions. The new and unique insight into the pre-collapse phase of the complicated process of stellar birth is based on observations made with ESO telescopes at the La Silla and Paranal observatories in Chile. Astronomers have known for some time that stars like our Sun are formed from interstellar clouds of gas and dust. When they contract, the interior temperature rises. If the cloud is sufficiently heavy, it will become so hot at the centre that energy-producing nuclear processes ignite. After a while, the central regions of the cloud reach equilibrium and a new star is born. Planets are formed from condensations in the surrounding material as this collects in a circumstellar disk. A good understanding of the origin of stars and planetary systems, like our own solar system, is therefore intimately connected to a detailed knowledge about the conditions in the cold interiors of dark clouds in interstellar space. However, such clouds are highly opaque and their physical structure has remained a mystery for as long as we have known about their existence. The following phases of stellar evolution are much better known and some scientists therefore refer to these very earliest stages as the "missing link" in our current picture of star formation. The present results are changing this situation. By means of a new and straightforward observational technique, it has now been possible to explore the detailed structure of a nearby cloud. It is found to be quite simple, with the mean density steadily increasing towards the centre. In fact, the way this happens (referred to as the cloud's "density profile") is exactly as expected in an isolated gas sphere at a certain temperature in which the inward force of gravity is finely balanced against the internal thermal pressure. With this clear physical description it is now possible to determine with unprecedented precision (approx. 3%) the fundamental parameters of the cloud, such as its distance and gas-to-dust ratio. ESO astronomer João Alves from the team is content: "These measurements constitute a major breakthrough in the understanding of dark clouds. For the first time, the internal structure of a dark cloud has been specified with a detail approaching that which characterizes our knowledge of stellar interiors". The observational technique that has led to the new result is straightforward but rather difficult to apply to dark clouds. It is based on measurements of the light from stars that are located behind the cloud. When this light passes through the cloud, it is absorbed and scattered by the dust inside. The effect depends on the colour (wavelength) and the background stars will appear redder than they really are. It is also proportional to the amount of obscuring material and is therefore largest for stars that are situated behind the cloud's centre. 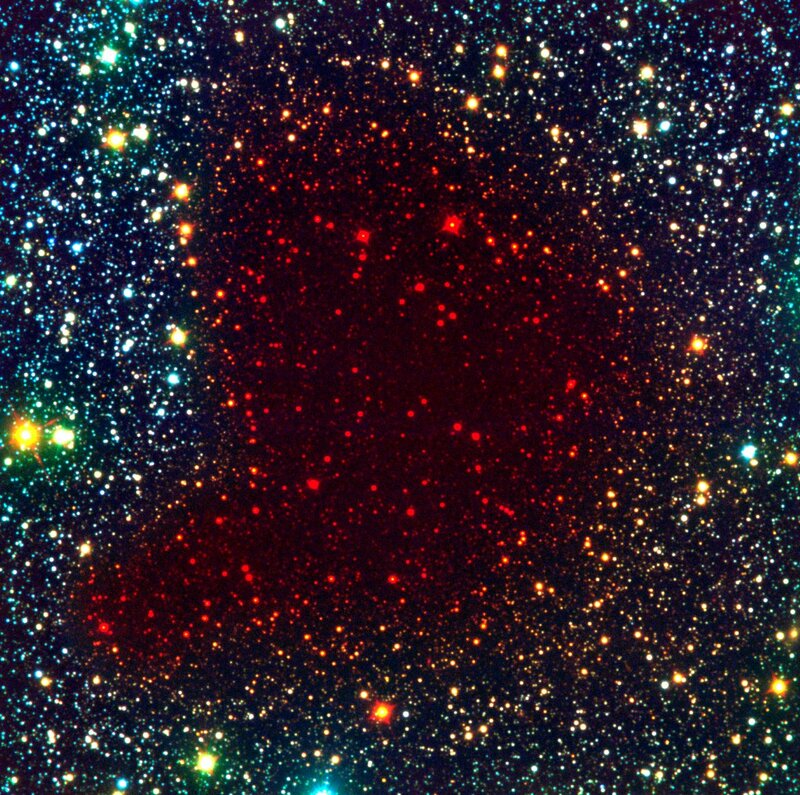 By measuring the degree of this "reddening" experienced by stars seen through different areas of the cloud, it is thus possible to chart the distribution of dust in the cloud. The finer the net of background stars is, the more detailed this map will be and the better the information about the internal structure of the cloud. And that is exactly the problem. Even small clouds are so opaque that very few background stars can be seen through them. Only large telescopes and extremely sensitive instruments are able to observe a sufficient number of stars in order to produce significant results. 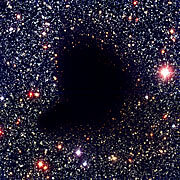 In particular, until now it has never been possible to map the densest, central areas of a dark cloud. At a distance of only 410 light-years, Barnard 68 is one of the nearest dark clouds. Its size is about 12,500 AU (= 2 million million km; 1 Astronomical Unit [AU] = 150 million km), or just about the same as the so-called "Oort Cloud" of long-period comets that surrounds the solar system. The temperature of Barnard 68 is 16 Kelvin (-257 °C) and the pressure at its boundary is 0.0025 nPa, or about 10 times higher than in the interstellar medium (but still 40,000 million million times less than the atmospheric pressure at the Earth's surface!). The total mass of the cloud is about twice that of the Sun. A new investigation of Barnard 68 was carried out by means of instruments at the 3.58-m New Technology Telescope (NTT) at La Silla and the Very Large Telescope (VLT) at Paranal. Long exposures revealed a total of about 3700 background stars (of which over 1000 can only be seen at infrared wavelengths). Careful measurements of the colours of these stars and hence, the degree of obscuration, allowed the most finely sampled (in more than 1000 individual areas) and most accurate mapping of the dust distribution inside a dark cloud ever performed. In order to further increase the accuracy, the mean dust density was measured in concentric circles around the centre - this resulted in a very accurate determination of the change in dust density with the distance from the centre. It was found that this dependance is almost exactly as that predicted for a sphere in which the opposite forces of gravity and internal pressure closely balance each other. Nevertheless, it is also evident that Barnard 68 is only marginally stable and is on the verge of collapse. This first-ever, detailed characterization of a dark interstellar cloud that is currently in the stage immediately preceding collapse and subsequent star formation constitutes a very important step towards a better understanding of earliest phases of the stellar life cycle. The astronomers suggest that Barnard 68 (and its neighbouring brethren, the dark clouds Barnard 69, 70 and 72) may be the precursors of an isolated and sparsely populated association of low-mass solar-like stars. However, where did these clouds come from? João Alves thinks he and his colleagues know the answer: "It is most likely that they are the remnant cores of particularly resistent parts of a larger cloud. By now, most of it has been 'eaten away' because of strong attrition caused by ultraviolet radiation and stellar winds from hot massive stars or 'storms' from exploding supernovae". He adds: "Our new observations show that objects with just the right mass like Barnard 68 can reach a temporary equilibrium and survive for some time before they begin to collapse". The team is now eager to continue this type of investigation on other dark clouds. The team consists of João F. Alves (ESO-Garching, Germany), Charles J. Lada (Harvard-Smithsonian Center for Astrophysics, Cambridge, Mass. USA) and Elizabeth A. Lada (University of Florida, Gainsville, Fl., USA). The Dutch astronomer Bart Bok (1906-1983) studied the dark clouds in the Milky Way and described the small, compact ones as "globules". 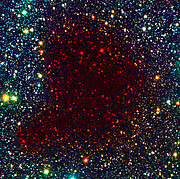 The early stages of the present investigation of Barnard 68 were presented in ESO PR Photos 29a-c/99, with more background information about this cloud. The research described in this Press Release is reported in a research article ("Seeing Light Through the Dark: Measuring the Internal Structure of a Cold Dark Cloud"), that appears in the international research jounal Nature on Thursday, January 11, 2001. 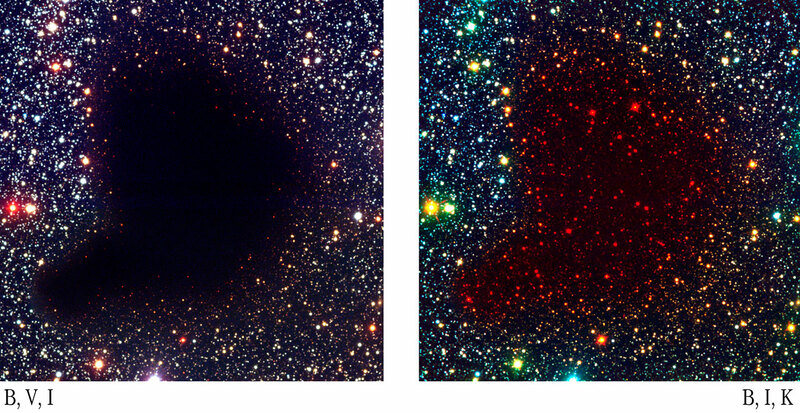 ESO Press Photo eso0102a of the sky area of Barnard 68 is based on three frames through B- (440 nm = 0.44 µm - here rendered as blue), V- (0.55 µm - green) and I-band 0.90 µm - red) optical filters, as obtained with the FORS1 instrument at the VLT ANTU telescope on March 27, 1999. The field measures 6.8 x 6.8 arcmin2 (2048 x 2048 pixel2 at 0.20 arcsec/pixel). ESO Press Photo eso0102b is a false-colour composite based on B- (wavelength 0.44 µm - 1.5 min; here rendered as blue), I- (wavelength 0.85 µm - 1.5 min; green), and Ks-filters (2.16 µm - 30 min; red), respectively. The B and I images were obtained on March 1999, with the FORS1 instrument at the 8.2-m VLT ANTU. The Ks image was obtained in March 1999 with the SOFI instrument at the ESO 3.58-m New Technology Telescope (NTT) at La Silla. The sky field measures about 4.9 x 4.9 arcmin2 (1024 x 1024 pixel2 at 0.29 arcsec/pixel). North is up and East is left. ESO Press Photo eso0102c allows a direct comparison between the two views.